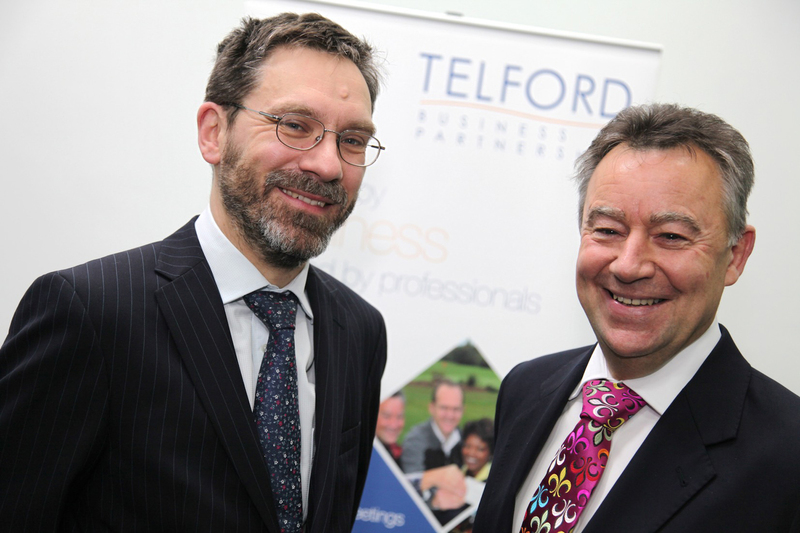 Shropshire businesses had the chance to hear the real truth about the economy thanks to a unique event. Telford Business Partnership hosted its quarterly breakfast meeting at the University of Wolverhampton's Telford campus in Priorsleee. Guest speaker on the day was Graeme Chaplin, the Bank of England's representative for the West Midlands and Oxfordshire, and delegates heard his views on the economy and its prospects. Our senior partner, Graham Davies, is the chairman of TBP, and he said: "The message was that UK growth was likely to remain subdued in the near term, before picking up further ahead. Inflation should continue to fall sharply in 2012, as the contributions of VAT, energy and import prices decline. But concerns about the solvency of several euro-area governments remains, increasing strains in banking markets. "This was a unique opportunity to hear the Bank's view of business prospects and their perspective on the future of the UK economy, and it was a wonderful chance to hear from an expert who really knows the industry inside out. "At TBP, we constantly strive to welcome quality speakers at our breakfast meetings who will deal with topical and sometimes controversial subjects. At this moment, nothing is more topical than the economy, financial systems and business prospects, so it's clear that with Graeme w really did have the right man at the right time." Winter weather conditions could cause havoc when it comes to Shropshire employees getting into work. But John Mehtam, our employment law specialist, says there are solutions which could help ensure your business can continue, whatever the weather. "In snow and ice, employees who drive off-road vehicles may not be concerned, but for drivers of smaller vehicles, you may need to look at alternative travel arrangements. "If you have a contract to complete and you're relying on your staff to turn up, paying for another form of transport such as taxis might be the way forward. But normally the Taxman will treat any payment of home-to-work and back travel by an employer as taxable for the employee. "So instead you may like to consider a more cost-effective car-sharing arrangement over the winter where the more confident drivers pick up their colleagues and bring them into work. "You can offer the drivers an allowance as an incentive, but set this at a level that will cost you less than a taxi. The payment will be treated as extra wages and subject to tax and National Insurance as normal, but the drivers will still be better off." John said if for some reason, the employee driving the shared car can't offer their colleagues a lift on any particular day, they will have to make their own way into work. "If this happens, and you pay for the employees who would usually share the car to travel home by taxi, in these circumstances it won't be counted as taxable income. "In such difficult economic times, it's vital that company bosses consider all the options in order to keep their business operating so they can meet urgent deadlines and delivery dates. By developing a transport policy now, before the really bad weather strikes, your company will be better prepared and ahead of the competition when it really matters." Company cars are crucial for many Shropshire firms, but could your business continue without them? Stuart Haynes from our commercial team said a company car was for many an essential business tool. "Whether you use it just to get to and from work, or to visit customers and suppliers, if for any reason you, your directors or your employees were without a car for any time, it could cause real disruption. "So that's why comprehensive car insurance is important - the aim is that if your car is stolen or written off, you'll receive compensation so you can get back on the road as soon as you can. "But given the way cars depreciate heavily from the moment they leave the garage forecourt - on average a new car loses 48% of its value in just three years - your insurance payout many not be enough to purchase a new vehicle. "And even worse, if you bought your car on hire purchase or a loan, your payout may not cover the balance you owe, so you'll be paying for a car you don't have anymore and you'll have to find more money for a new one." But Stuart said gap insurance was available to help settle the balance owing on any finance arrangement - although inevitably it came at a price and hte more cover you want included, the more the policy would cost. "It's not a new idea, but with the way new vehicles are depreciating, gap insurance is becoming increasingly popular. Don't just assume though that your car dealer is offering the best policy - shop around to make sure you get the best value deal." Stuart said some comprehensive car insurance policies offered to replace a car as new if it was written off or stolen in the first 12 months, so it was important to check the small print. "If your policy offers this, there's no need to double up on insurance, so only take out a gap policy after the right to a replacement vehicle has ended. Your company car is an important asset, and for the sake of your business, you need to ensure you protect it as best you can."